In addition to a fantastic menu, Rouge on Rittenhouse Square offers some of the ultimate people- and pooch-watching in all of Philadelphia. 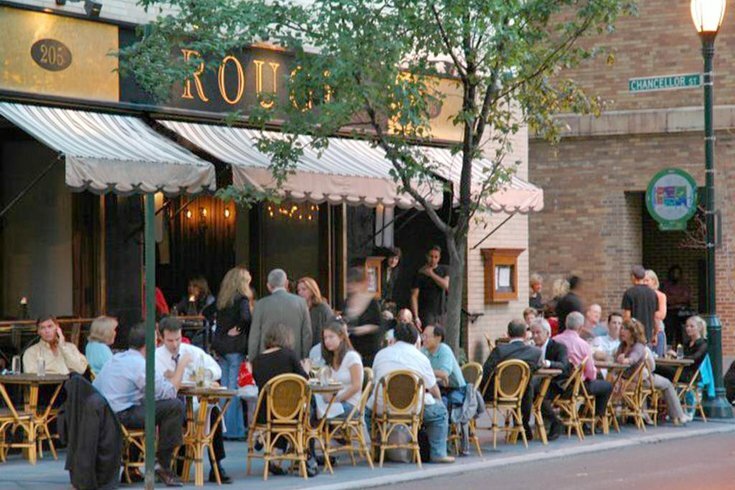 Rittenhouse Square bistro Rouge has reopened after a 10-week hiatus to renovate the restaurant's interior and spruce up its menu. The longtime sidewalk-front restaurant announced it's reopening on social media this week with looks inside and sneak peeks of the menu overhaul. The original designer of Rouge in 1998, Marguerite Rodgers, did the update. The iconic window- and sidewalk- adjacent dining spots are still center stage and the bar has expanded. Chef Sean McPaul (formerly of Talula's Garden) has come onboard and almost entirely recreated the menu, save for the Rouge Burger, according to its social media. And Hop Sing Laundromat's Lê — who is also working on an upcoming banh mi shop — has redesigned Rouge's cocktail menu. Here we go, Rouge fans! After 10 weeks of hard work, we’re proud to show you the new @98rouge, a fresh look for the bistro that established Rittenhouse Square as a dining destination and launched the sidewalk-dining revolution twenty years ago. Look around: Designer Marguerite Rodgers has updated our spirit of romance, conviviality, and joie de vivre, while borrowing elements from our debut in 1998. New chef Sean McPaul has created an exciting menu that has kept only our signature Rouge Burger, and the cocktail genius Lê of Chinatown’s hip Hop Sing Laundromat has crafted a list of sophisticated drinks served at our newly expanded bar. Two things that haven’t changed are our dedication to warm hospitality and, of course, our magical view from the windows and the sidewalk. Dinner nightly begins Sunday, March 17, with lunch on board Thursday, March 21. Weekend brunch starts Saturday, March 30. Please note that in the early days, we’ll accept walk-ins only until we get up to speed. Come in and see us! "After 10 weeks of hard work, we’re proud to show you the new @98rouge, a fresh look for the bistro that established Rittenhouse Square as a dining destination and launched the sidewalk-dining revolution twenty years ago," was posted to the restaurant's Instagram on Friday. Dinner service resumed on Sunday, March 17, and lunch service will begin again on Thursday, March 21. Weekend brunch will start service on Saturday, March 30. And as it gets off the ground, there will be walk-ins only.